Teaching Authors--6 Children's Authors Who Also Teach Writing: Interview with Poet Janet Wong & a Book Giveaway--Happy Poetry Friday! Interview with Poet Janet Wong & a Book Giveaway--Happy Poetry Friday! I've known Janet since we were in classes taught by poet Myra Cohn Livingston during the Pleistocene epoch. Among other accomplishments, Janet and her co-editor, Sylvia Vardell, have revolutionized the way poetry is published in their Poetry Tag Time eAnthologies. And in honor of our upcoming 3rd (!) 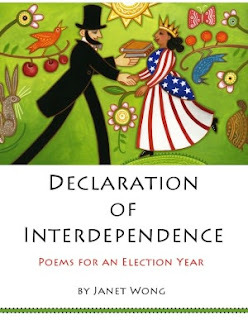 Blogiversary (April 22nd), Janet has generously donated THREE copies of her timely book, Declaration of Interdependence: Poems for an Election Year. Read more about the book and details on how to enter to win your own autographed copy below. Our friendship is not why I've invited her today. Janet is a force of nature in the world of children's poetry--that's why I wanted you to meet her today. 1) How did you officially become a TeachingAuthor? I had my first “teaching author” gig in May 1994, four months before my first book, Good Luck Gold, was published. On a Friday I got a call from a bookseller who had heard me speak and wondered if I would visit a middle school near LAX. An author who was scheduled for Monday had canceled. Could I fill his spot? Three days later, I walked into an auditorium of 700 seventh graders. I introduced myself, read a poem about race discrimination, “Waiting at the Railroad Cafe,” and was greeted with thunderous (truly, thunderous!) applause. After the assembly, kids said: “I like your poems because I know they’re real.” What an amazing feeling of accomplishment at having connected with those kids! I knew that I wanted school visits to be a big part of my life as an author. 2) What's a common problem/question that your students have and how do you address it? The most common problem: what to write about. I want to teach kids that their own everyday experiences--even seemingly trivial ones--can be good material. I’ll read a handful of poems and talk about the stories behind the them: why I wrote about my dad’s anger, why I wrote about noodles for breakfast, why I wrote about hiking in the woods. Some of the kids must wonder: “That’s good enough for a book? But then you could write about anything!” Exactly! You don’t have to have an “exciting” dream-filled life in order to write. I also want kids to write just for practice, just for fun, at home. Write an ode to cookies that is so mouth-watering good, it will inspire a mom to say, “Yes, we should bake some cookies today!” I want kids to know that they have the power to make good things happen with their words. 3) Would you share a favorite writing exercise for our readers? My most successful writing exercise is a simile exercise that I usually do when I visit schools. Here it is, broken into 10 steps. Step #1, Introduce Similes: I introduce similes before they even know that an exercise is coming. Showing--not telling--what a simile poem is, I read “Dad” from Good Luck Gold (my dad as a turtle, hiding in his tough shell), and sometimes also “Sisters” from A Suitcase of Seaweed (sisters who are opposites, like fiery ginger and soft tofu) and “The Onion” from The Rainbow Hand (mom as an onion; you cut her and yet you cry). Step #2, Describe the Prompt: I say: Take someone in your family (mother, father, brother, sister, grandmother, grandfather, uncle, aunt, cousin) and turn that person into a plant, animal, or object--but don’t make the mistake I made with calling my dad a snapping turtle--make it a loving idea, an idea that can become a gift poem. Step #5, Draw for a Minute: Drawing for the group, I show how you can change a negative idea into a positive one if you imagine that there’s a “video in your mind” and you let it run. 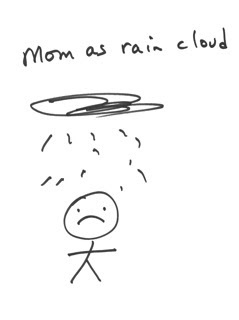 What starts out as a rain cloud might turn into a sunny scene with a rainbow, transforming the idea of a stormy mom into one who is just a bit moody, like spring weather. I also like to show that there’s more than one way to draw something. 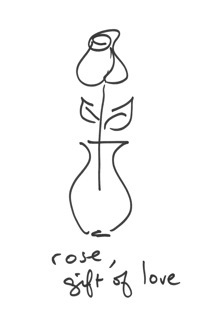 For instance, if you draw a rose one way, you might think of a perfect rose, a gift of love. 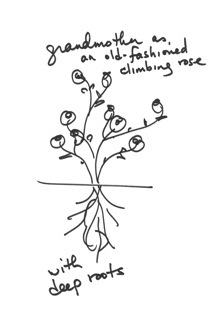 Or you could draw the whole bush and it might help you think of a grandmother as an old-fashioned climbing rose with deep roots. Step #6, Share Ideas: For the next several minutes, I invite kids to share their ideas aloud so that the whole group can hear. I tell kids that if I pick them, I want to be able to use their idea for my own poem, and also want them to allow other kids (who might not like their ideas) to use their idea, too. This is yet another way of making sure that every student has something positive to write about.During this sharing portion I help students fine-tune (or change) their ideas, especially in terms of making them “more loving.” For instance, if a boy says his sister is a pig, I’ll say, “Is she very intelligent? Pigs are very intelligent creatures. They are strong, sturdy, not fussy, they are good in groups and give their lives to us. Is your sister this way?” After seeing that a negative idea fails to get the shocking reaction they’re after, these kids with less-than-loving ideas often surprise with moving poems on a completely different subject. Step #7, Suggest Music: Rather than just say, “Now write a poem,” I give a one-minute lesson on rhyme, repetition, and rhythm. I ask them to “put a little music in the poem”--and we’re off! Step #8, Write: I write at the same time as the kids. Using chart paper or the board, I let students see me struggle with their same writing exercise, crossing words out, making a “sloppy copy,” and then a second very different draft. Kids who don’t know where to start can see that I plunged in and started my first draft quite simply--just “my cousin is like a [something].” Not all of them start their poems this way, but I think it takes the pressure off them if they can copy my format. I’ll usually write a second draft during the same five minutes and will deliberately try to make it very different (but still on the same subject). 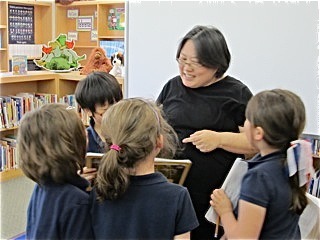 Janet Wong with students at Heritage School in Newnan, GA. Step #9, Evaluate: I don’t ask, “Did anyone write a good poem?” Instead I ask, “Is there anyone who wrote something--start of a poem, part of a poem, whole poem--that is better than you thought it would be?” This is key: having the courage to try, especially when you’re not inspired, and being happy when you can surprise yourself. I also point out that a poem can be short and still be good by reading my poem “Down Dog” from TWIST: Yoga Poems. That poem is only 14 words long, but one of my own favorites. Step #10, Share the Poems: It’s important that we make time for children to share their poems by reading them aloud. It takes less than 30 seconds for most children to read a poem aloud. I like to point out favorite parts of poems but also lines where the child could add or change a few words to give a head start on a revision. 4) What one piece of advice do you have for teachers? Pick exercises that have “real world meaning” for you. The week before the birthday of your mom, your husband, or your child, have all the kids write a birthday poem for someone in their families. If you love gardening, bring in a bunch of gardening catalogs and have kids scour them for found poems. Create an e-book anthology as a fundraiser and earn money for a classroom party, field trip, or your library. If your writing exercises have some sort of real world meaning for you and your students, the enthusiasm will be genuine and infectious. 5) Can you share a funny (or interesting) story with our readers? I did a drop-in Q & A at a high school where a student once asked, “How much money do you make?” When I told him the sad truth, he stood up and left the room. I guess it wasn’t worth his time to sit and listen to someone who makes as little as 10 cents per book! This made me realize how important it is to make writing seem profitable to kids. The reality is that very few authors make a “good” income. But writing, as a skill, can help people make millions and “live rich.” Kids perk up when I explain that a good sportswriter can go to the Super Bowl or World Series for free. You can drive a Ferrari one week and a Lamborghini the next if you are a car reviewer. The suggestion they love the most: developing video games. In Minn and Jake’s Almost Terrible Summer, Jake carries a notebook in his pocket because he wants to capture ideas that pop into his head--ideas for video games. I tell kids about a video game developer who once told me that “the writer is the most important person on a video game team.” Before illustrators go wild, before programmers get practical, first you need a story: a setting, characters, and a basic plot (Level 1, Level 2, and Level 3 in a game). 6) What's on the horizon for you? More e-books! I love the freedom: you think of an idea, you write it, and a week later the e-book is out, on Kindles and iPads all over the world. It’s exciting to look at the royalties and to see that an e-book has sold in Australia or Ireland. 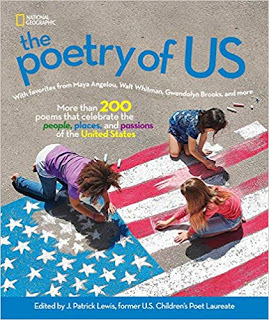 7) And finally, since it's Poetry Friday in the Kidlitosphere, do you have a poem you'd like to share with our readers? I'm thrilled you stopped by! We'll be following your blogs and gobbling up your new hold-in-your-hand books, eBooks and eAnthologies! This is April speaking now: before we get to Janet's Book Giveaway, I'm asking you with big puppy dog eyes to stop by and read an original dog poem a day on my Poetry Month blog. Eli has just performed surgery on his friend, Squirrel. You may either post your answer as a comment below or email your answer to teachingauthors at gmail dot com with "Contest" in the subject line. If you enter via a comment, you MUST include a valid email address (formatted like: teachingauthors at gmail dot com) or a link to an email address where we can reach you. Your entry must be posted or received by 11 p.m. April 19, 2012 (Central Standard Time). The winner will be chosen in a random drawing and announced on Friday, April 20, 2012. G'luck! Good morning, April and Janet. My favorite piece of advice from Janet is to point out the perks of writing to kids. My brother happens to be a video game designer -- yes, he writes the storylines for the games. I am starting a poetry residency at a very diverse school next week. If I were the giveaway winner, I would donate "Poems for an Election Year" to Swansfield ES in Columbia -- a National Poetry Month gift! Hi there April (and Janet), this is such an amazing post in so many levels. 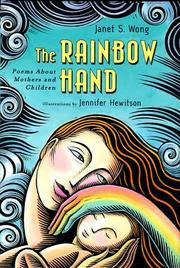 I have read a few of Janet's poems and I just checked our community library, we do have Rainbow Hands. Will reserve soon. I loved reading all about her process for teaching. I was sucked in and wished I was sitting on a hard floor with paper in hand listening to her, creating! If I won this giveaway I would happily donate it to my school's library, sharing it with many deserving children and teachers at Fern Persons Elementary in Michigan. Wonderfully encouraging post and thanks so much for the ten step simile exercise - super helpful! OK, so truth be told, if I win I think I would keep the copy! 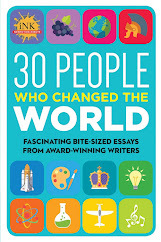 What an amazing post - so rich in ideas about writing and teaching! Thank you Janet and April. I want to try the simile exercise as soon as school begins. I would keep a copy of Janet's book to encourage and inspire my students. Wow--I knew quite a bit about Janet already, but this interview is full of surprising new looks at her many activities. Thanks, April! I can't wait to receive the book I won at a different blog (which I will enjoy thoroughly and then donate to my school's Media Center just in time for election season)! Author Amok, Myra, Betsy, Joanna, Robyn,Tara,Heidi~~thanks for dropping by. And yes, Janet was an amazing interview! G'luck to those of you entering the contest! Thanks for your great comments, everyone! I hope some of you try the simile exercise with kids and let us know about your experience with it. I'm very proud to say that the poems that come out of this are first-rate. I think the key is the way the exercise is broken down into simple parts. One of my favorite recent similes (from Tom, a middle school student) is: "My mom is like the Cheez-Its in the back of the pantry; I might not always reach for her, but she'll be there for me, when the Pop Tarts are gone." I never would have thought of using drawing in a lesson on simile. It's an interesting approach! If I were to win, I'd give the book to the public library where I work. That way, it could be shared with lots of kids, and, I could write about it for a Poetry Friday post on the library's blog. I love the way you broke down the steps, Janet. I do similar exercises, but I learned some tweaks here that I'm going to make at my young authors conferences in May, mostly with helping young poets to be kind and to share ideas. Thanks! If I won Janet's book, I would read it, share a poem on Poetry Friday, and then donate it to a school library. I'm at lauras_accounts (at) yahoo (dot) com. Congrats on e-publishing To Rabbittown, April! What a great topic to address with poetry. I would probably keep the book to use with my classes during election time. Hello. 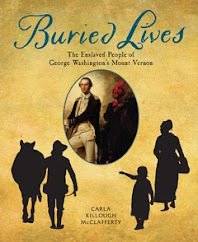 If I won this book I would utilize it with lessons in my classroom during an election unit, and also make it available for other students to read. I am a young teacher and I'm still working on building a library for the classroom. I love Janet Wong's book You Have to Write. I provide professional development for teachers so I would probably use the book as a prize during one of my sessions. I will try the simile exercise with teachers so they can go back to their class and try it with their kids. If I am lucky enough to win this book by one of my very favorite poets, I will be selfishly unselfish. I collect books on the Constitution and about American governmnet. I take them to various 5th and 8th grade classes to help students learn and write about our Constitution and government. After perusing and discussing the books, I have them write both essays and poems. 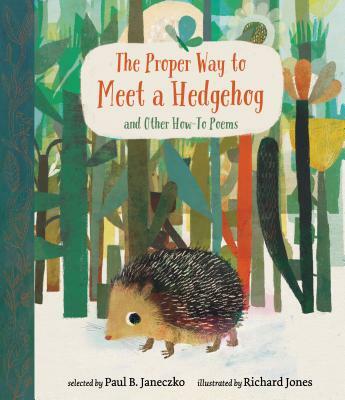 This book would be incredibly helpful in demonstrating how poetry often sends the best messages. Diane: I think that drawing works well with this simile exercise because a simile is, by its nature, visual. And drawing also gives kids a chance to develop their ideas a bit before the pressure of the quick-write. Laura: breaking the prewriting part of this exercise down into steps is the key to its magic, I think. I hope that you share your own poem-writing exercises--at least briefly describe a couple of your favorites--when you preside over the festivities at the Evanston Public Library in a couple of weeks! Elsie: Teachers often enjoy writing gift poems for their spouses or significant others or children--it's great to leave a workshop with a "free" birthday or anniversary gift. Margo: Please do share my election poems with your stepson and daughter--I'd love for DECLARATION OF INTERDEPENDENCE to prompt discussions at school AND at home! Thanks, everyone...and good luck! I think that April will be pulling names soon for the book giveaway! 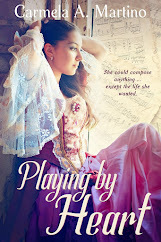 I am so happy to hear Janet is pursuing more e-book projects! I love the accessibility of these. 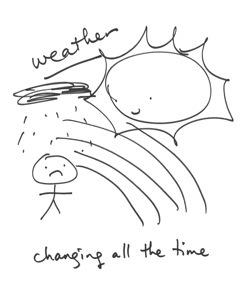 And I also love incorporating a little art/drawing into poetry writing. This can really loosen kids up and engage the ones who are more visual/tactile learners. Thanks so much for stopping by and g'luck, Irene, Margo,Pam, Elsie, Laura E, Heidi G, Laura Salas, and Diane! I was privileged to meet Janet at a teachers' conference in Malaysia several years ago. In her workshop, she gave us the idea of creating a kindle anthology of our students' poetry. I've done this with my 5th grade class for the last three years, and the students love it! They're responsible for cover design, as well as coming up with the dedication and acknowledgments and choosing a charity to which the proceeds will be donated. A Boom in the Room, Sunshine Leaking, and Better than Cotton Candy have all been wonderful projects that have resulted in some very proud 5th graders (and parents)!